Pablo's space walk is almost done. The biggest hurdle has been the visual design of it all. Usually creating the visual motifs to the empty, abstract scenes of pure gameplay has been the easiest part of level design, but I really struggled with this one. I guess it was because I had such high demands; I wanted it to look like a proper space station exterior, yet I wanted it to look unique as well. I wanted it to look like TAGAP 3, but at the same time it needed to be familiar enough for sci-fi buffs to go 'yeah, we're outside on a space walk all right'. It was a tall order, but I think I've nailed it. Only some of the scrolling parallax backgrounds to go and we're done with this section. Next up? I've got two options; It's either creating the boss fight arena for the level the space walk was part of, or starting work on a brand new section. I really don't know yet which one I'll go with and that's really what I love about the early content creation; So much needs to be done that you'll have plenty of roads to choose from! TAGAP 3 – Everything concerning the upcoming TAGAP 3. Keep an eye out for updates! TAGAP 2 – Showcase for TAGAP 2, our latest release from 2011. TAGAP – Showcase for the original TAGAP from 2007. Downloads – Download TAGAP 2, TAGAP and desktop extras! 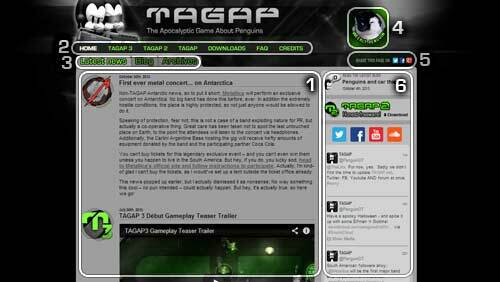 FAQ – FAQ featuring troubleshooting, a walkthrough and guide for playing TAGAP 2 on Mac. The biggest difference is the fact we're now based on CSS, as opposed to the previous three versions that were all manually coded and styled HTML. Web engineers out there might gasp in horror about that and scream 'why didn't you do this in the first place?'. The answer is simple; When the site launched I wanted to make it readable on any device under the sun, including even-then-elder smartphones like Nokia Communicator. And those didn't handle CSS properly, often actually crashing on sites that used it excessively. Another big change is the screen real-estate usage. Again back in the day I wanted the site to be readable on pretty much any monitor, even the dinosaur-aged CRTs, so I forced everything into 800x600 area, with one column of content. But that's the catch; This isn't 2007 any more, this is 2013. Every smart phone can browse the Internet smoothly, most of them even have modern browsers, widescreen monitors have taken over and even the bloody tablets are in HD now! So, the total website rewrite commenced. And it was a giant workload – heck, there are over 320 pages for Weekly Penguins alone! Page by page I rewrote the site, converting it into proper CSS styling. Given I've devoted myself to two things past month, TAGAP 3 and one other non-gaming thing you'll be exposed to soon enough, it has taken quite a while. So long in fact, that I've effectively had two websites to maintain simultaneously, as all the new content I've made I've had to write again for the new layout. But finally, here we are! This being such a massive update, there's always a risk that something went kaput somwhere down the line in case of a page or two, so if you find out something that doesn't work, please let us know. In fact, please do let us know what you think of the new site in general. Just prior to this site re-launch I was asked about the forums and if they would be returning soon – or at all. Well, as you can see from the new site, we're going with 'no'. The forums have been shut down, at least for the time being. Why was this? Simply put; We didn't have the time to keep it moderated and updated. Right now we're developing TAGAP 3 as well us updating TAGAP.net, Facebook and Twitter all the while pushing new media on YouTube and Soundcloud. We had to make a decision to cut something, otherwise TAGAP 3 itself would start to suffer. So, we decided the Forum would have to go. Remember, we're a super-small group and unlike actual companies who have folks dedicated solely for running PR and media blitz, we're doing it all by ourselves, on our free time. For example I myself spend all my free time working on TAGAP already, sans the couple of hours reserved to Doctor Who and playing other folks' games, so we can't stretch much further without causing problems for ourselves. I want to thank Alex Nordlund and Jussi Koskenkorva for helping us with the forum – and of course everyone who contributed to the boards. You guys rock! And if you don't have accounts to any of these, feel free to drop us comments directly via our contact form. If we one day find ourselves in a position we could confidently relaunch the forum, I'll let everyone know. In the meantime, I hope this change hasn't clouded anyone's day. Small update on Doctor Who experiences. To put it short; If you consider yourself a fan of the show, you cannot afford to miss The Light at the End, the 50th anniversary audio drama from Big Finish. It's good. No, no it's not... it actually borders on 'perfect'. It goes to the point I'm now genuinely worried that how on Gallifrey could Steven Moffatt and the crew even hope to compete with this, let alone beat it, with The Day of the Doctor. I'm not going to say anything about the plot of the The Light at the End, other than it involves all the Big Finish Doctors, their companions and The Master. It's simply concentrated brilliance, available as MP3 download, 2-CD, 5-CD special edition and even Vinyl – and if you pick your poison directly from Big Finish, you'll get 5.1 special mix as well as an icing on the cake. I know this might have sounded like an advert, but I can't help it; It's just way too good!